Brady’s first birthday party was so much fun. 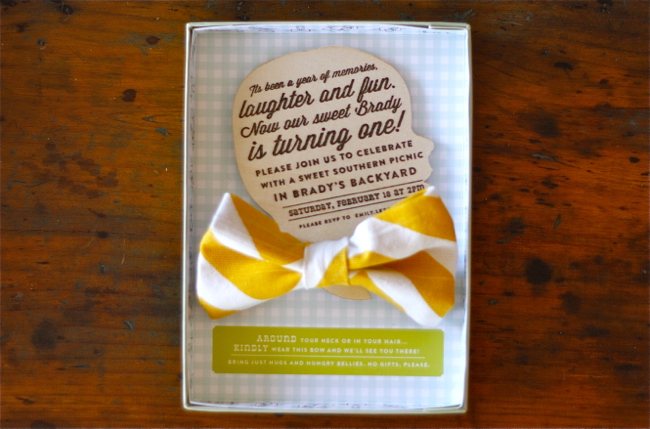 We decided we wanted it to be sweet and young and classic… so we chose a “Southern Picnic” theme and used bow ties to tie the entire affair together. I worked and worked on his invitations and could NOT for the life of me, create something worthy of his very first birthday (I’m crazy, I know). I knew I wanted them to be tactile, not just a piece of paper. I wanted them to be Southern and sweet and with the personality of a playful little boy. So I emailed my dear friend Amber Moon, of Pitbulls and Posies, an email with the subject line “HELP”. She went right to work and together we conceptualized the most adorable invitations I’ve honestly ever seen. I took a photo of Brady with my iPhone and sent it to Amber, she traced his sweet little head and created these little wooden silhouettes which she then (by hand, no less!) screenprinted with the party information we designed together. 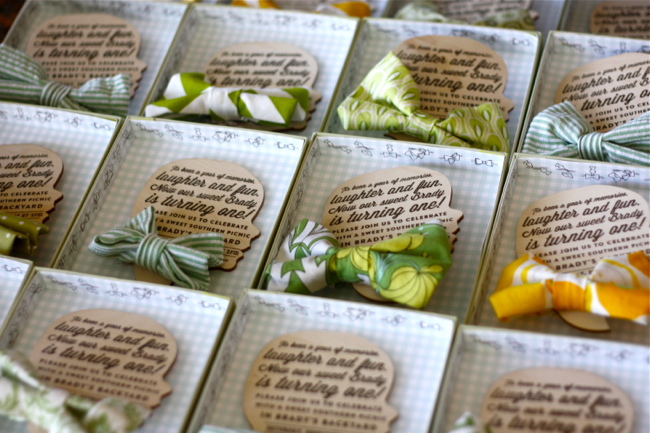 She also designed and created box liners to hold the sweet little silhouette. Meanwhile, my friend McKay of Oatmeal Lace Designs designed and created bows and bow ties for all of Brady’s little friends. 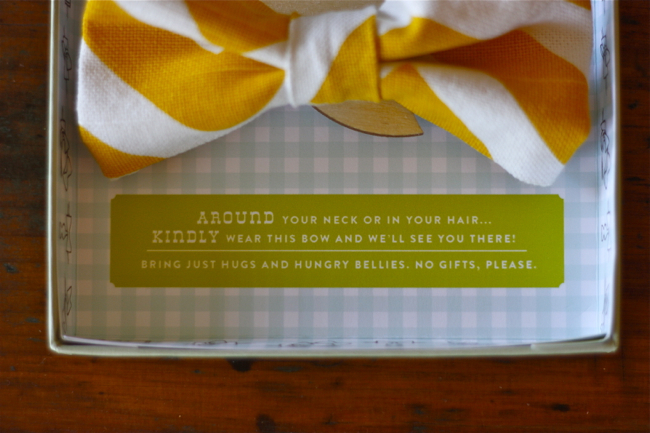 The invitation read “On your neck or in your hair, kindly wear this bow and we’ll see you there!” The bows and bow ties were fastened around the silhouette neck and packaged in the boxes. 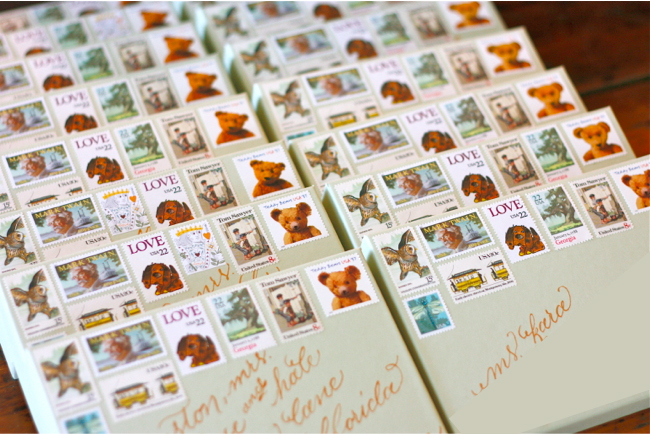 MEANWHILE, my friends Courtney Scowby of Brightly Designed and Jessica Ulrich of MJ Paperie designed the vintage postage stamp layout (Courtney) and calligraphy addresses (Jessica) respectively. Have I mentioned we have the best, most talented friends, EVER? I’m still in awe of these invitations. If you’re looking for something really different and custom and personal… Amber, Courtney and Jessica are amazing. I plan to display/frame ours (we had one addressed and stamped to us as a keepsake) in our house somewhere as a reminder of B’s first big day. 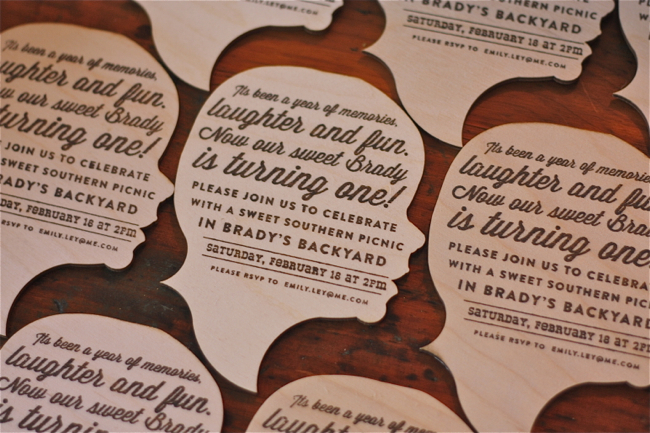 Next up… Brady’s birthday party. I got all teary eyed just looking through all the detail photos tonight.